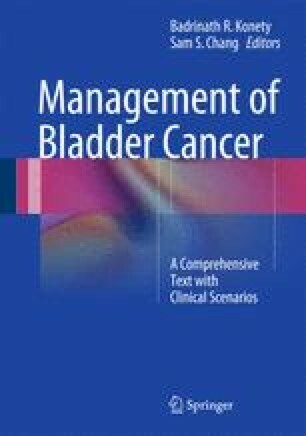 Localized surgical therapy and surveillance examines the evidence and practice of two of the most important aspects of management of localized bladder cancer. The first part, surgical therapy, comprises preoperative assessment (including preoperative imaging studies, laboratory investigations, and antibiotic prophylaxis) followed by transurethral resection of bladder tumor. This section explores the principles of TURBT, including resection depth, staged resections, and bladder drainage. Specific circumstances such as tumors at the ureteral orifices, lateral/anterior walls, within diverticulae and reresection are specifically addressed. The second part of this chapter, surveillance, examines the evidence and practice of surveillance of NMIBC following resection. This includes a discussion of risk stratification, so appropriate surveillance strategies can be correctly applied. Specific areas such as cystoscopy schedule, first cystoscopy, further cystoscopies, methods to improve surveillance cystoscopies, use of urinary markers, imaging and upper tract evaluation are discussed in more detail.